So I’m assuming the new McIngvale Rd exit will be exit 2. I can't hit on this enough. I-269 is a very nice stretch of interstate and even the pavement they used was top of the line to help with wet weather conditions. However, the I-22/I-269 is poorly done. There is no lighting. There is no signage on I-22 north bound that lets you know it's going to end. The trailblazers are normal size and it just has an end label on top. It's nothing like the large sign on I-69 going towards Tunica that says End and Begin. There was also little hope of I-22 ever picking back up, with the cloverleaf design. It's almost like getting a BMW and putting cheap wal mart tires on it. That junction has the potential gateway to lead traffic from mid America in states like Oklahoma, Arkansas, Kansas, exc that want to travel into the southeast like Atlanta, Birmingham, exc. Shouldn't the "END" and "BEGIN" signs be above the route numbers? It might not be a requirement, but it would look better. They forgot the "Burma-Shave" at the end. Looks like that "sign salad" got stuck on one tine of the fork! Or, alternately: sign kabob! I believe that control cities on beltways are now required when running concurrently with another interstate, but not until new signage is posted. With all the work on I-465 that has been done in the last few years, all the new signage lists Cincinnati and Peoria as control cities on the stretch concurrent with I-74. I'm guessing when I-69 is finished and running along 465 that they'll be required to post control cities for it as well. I've never seen "TO route" posted very consistently in all my travels. A shame, but each state's DOT must decide and they're not at all consistent as we know. The MUTCD does require the "END" sign to be above the route number. If used, the END auxiliary sign shall be mounted either directly above a route sign or above a sign for an alternative route that is part of the designation of the route being terminated. The MUTCD also requires the "BEGIN" sign to be above the route shield. If used, the BEGIN auxiliary sign shall be mounted at the top of the first Confirming assembly (see Section 2D.34) for the route that is beginning. I understand TDOT not wanting to change over the entire road until I-69 gets built from I-40 to Millington. Yet, they should assign that roadway another name all together. 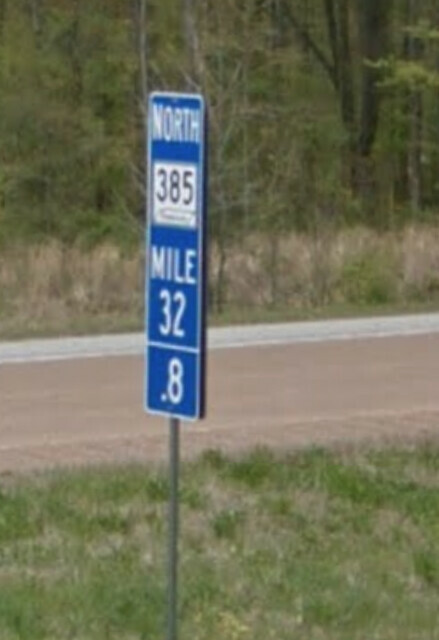 The mile marker confusion plus 385 in Southeast Memphis will always be SR 385. It's going to confuse non locals for sure. It's a typical West Tennessee TDOT mess. The fact that TNDOT has no intention of co-signing TN 385 over the N-S I-269 segment certainly creates a navigational mess for local drivers; one of the two remaining TN 385 segments -- preferably the less-utilized north segment -- should get a new state highway number. Logically, it would be TN 269 until such time as I-69 is constructed -- but that might be expecting too much of the agency to make that change. An open question to local posters: are TN state highway numbers legislatively designated (like here in CA) or are they administratively selected within TNDOT? The fact that TNDOT has no intention of co-signing TN 385 over the N-S I-269 segment certainly creates a navigational mess for local drivers; one of the two remaining TN 385 segments -- preferably the less-utilized north segment -- should get a new state highway number. Or the southern TN 385 could just be renumbered as I-22. First: it's Memphis, where major streets have a tendency to change names seemingly at random. 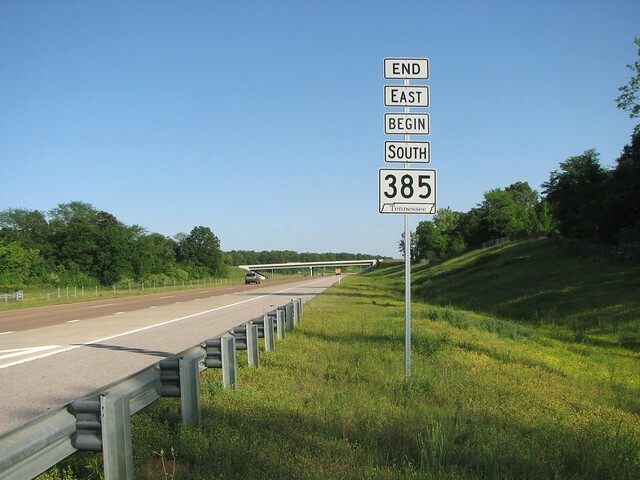 Second: in local media, the southern 385 has been referred to by name rather than by number, to avoid questions about which segment of 385 is being discussed. Third: don't most people rely on sat nav apps these days when navigating to unfamiliar destinations, reducing highway numbers / street names to being mostly just visual cues on exactly where to turn? It might not be a navigational mess for local drivers accustomed to local vagaries or departures from norms seen elsewhere -- but to "newbies" or those simply attempting to navigate the area while visiting the presence of two segments, east delineating a E-W freeway, bearing the same number might become confusing. And that isn't a condition that would likely be programmed in apps; distinguishing the "north" section of 385 from the "south" section would likely throw such into a bit of a tizzy if not pre-programmed to recognize landmarks or mileposts or interchanges from one another. While I like the idea of the southern (Collierville) segment of 385 becoming a I-22 extension -- the lack of a direct SB>EB flyover ramp at the 22/269 interchange is a negating circumstance (nobody needs a duplicate of the I-80/I-74 cloverleaf in IL, with two trunk routes schlepping through a low-speed single-lane loop). But then TN has built both of its freeway-to-freeway junctions (save the I-69/MS 304 separation east of Tunica) as cloverleaves -- so "cheaping out" (although the 22/269 involves 4 individual bridge structures to accommodate the C/D lanes) seems to be a state or regional priority, likely because of funding shortfalls. Even out here in tech-happy San Jose, only a handful of people I know regularly depend upon phone-based or in-car navigational aids to get around; and those that do simply locate addresses and use their personal built-in systems (i.e., their brains) to figure out how to get from point "A" to point "B". Ironically, a couple of apps haven't figured out (or have been programmed to recognize) that there's no direct access from CA 87 to I-880 (it crosses, so therefore it must have an interchange!? ), to the surprise of folks coming in from elsewhere (including a number of my customers, who would access my business from CA 87). So, for many, it's back to AAA maps and a decent learning curve! Bingo. Imagine you just moved to the Memphis area. Someone says go to 385 and....... Well most people in Memphis that I know of thinks 385 as Bill Morris Parkway. The southern route of 385. 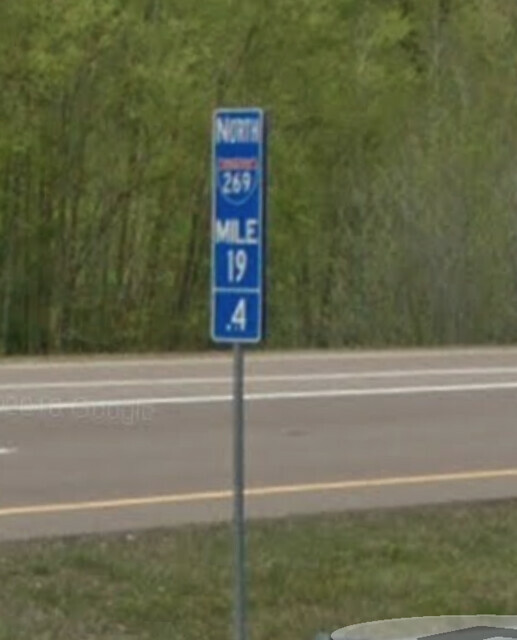 If you want to keep the northern segment posted as 385, they should remark the mileage markers with that of I-269 and future I-269. Maybe even put exit numbers on the signs they have. 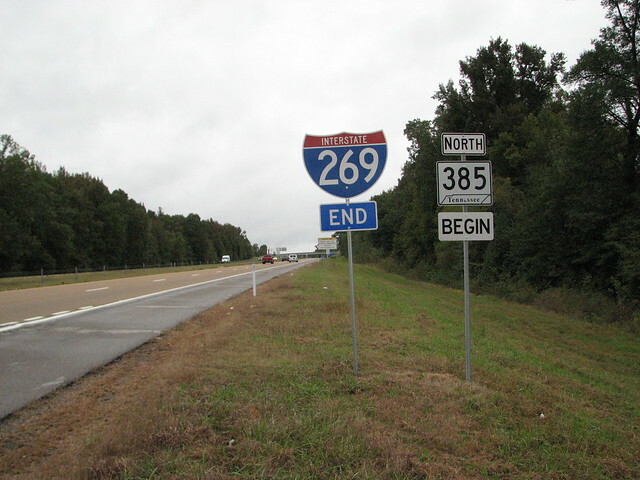 It would be easy for the transition this way, when it officially becomes I-269. It looks like it will be decades though before I-69 construction ever begins between Millington and Dyersburg. I know there is a strong political effort by Millington and Northern Shelby county to have I-69 built between downtown Memphis and Millington. I doubt we see that anytime soon. The logical alternative would be to just rename the road. That being said, TDOT already went the cheap way with exit signage on I-269. On top of it, I don't think TDOT has officially renamed the road, despite signage. They might have and I might have missed it. Not to get off the rails, but GPS in the San Jose/San Fran valley has burned me so much, I check the routes on paper before even attempting. The night I got dragged through a SFO city street and over a hill just to find SFO had allowed someone to build at the far end (creating a dead end) without so much as a warning sign. I had to back out (couldn't turn around) up and over a hill to get back to a "normal" street. Rant over. I assume TDOT doesn't want to change the signs over until there are actual control cities (like Millington) to direct people too. Expecting TDOT to say anything about I-22 anywhere, when MDOT can barely sign it themselves is probably asking too much. I agree, it will be 10-15 years before any changes take place. Once upon a time, Tennessee's license plate numbers began with a one- or two-digit county code representing the rank-order of the county of registration by population size. I swear that Tennessee changed that simply because the powers-that-be got tired of Davidson County being number two. INDOT does the same thing with Evansville, they like to pretend it's in Kentucky. Technically, when you stick your toes in the Ohio River, you are. Well, if you take US41 south you're in Kentucky before you cross the river. It has also been said that we have a bit of a "twang", although I have no idea what you'll are talkin about. Unlike the general public, truckers have a vested economic interest in discerning and locating improved ways to get from point "A" to point "B" regardless of posted "trailblazer" indicators. They would have discovered I-269 as the most efficient way from metro Memphis to I-22 on their own -- but for the average non-pro driver -- particularly those not intimately familiar with the area, some sort of announcement along I-55 mentioning that I-22 can be accessed via I-269 would be helpful for general navigational purposes.